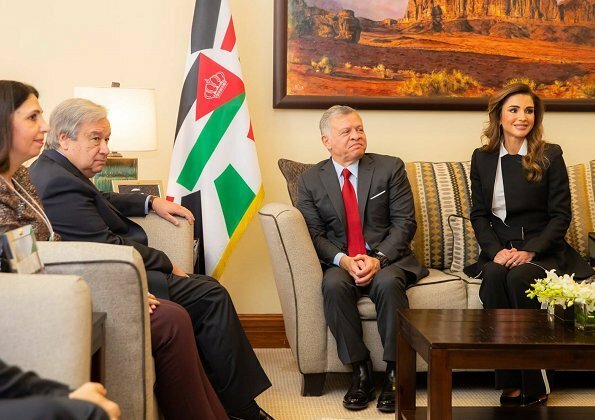 On April 06, 2019, Queen Rania of Jordan met with the wife of Turkish President Recep Tayyip Erdogan, First Lady Emine Erdogan in Abdoun, Amman. 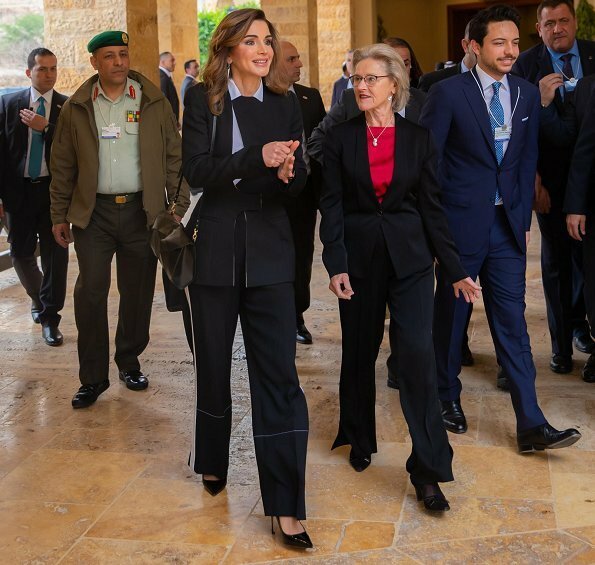 Turkish First Lady was visiting Jordan to participate in the World Economic Forum on the Middle East and North Africa, which commenced on Saturday at the King Hussein Bin Talal Convention Center in the Dead Sea. 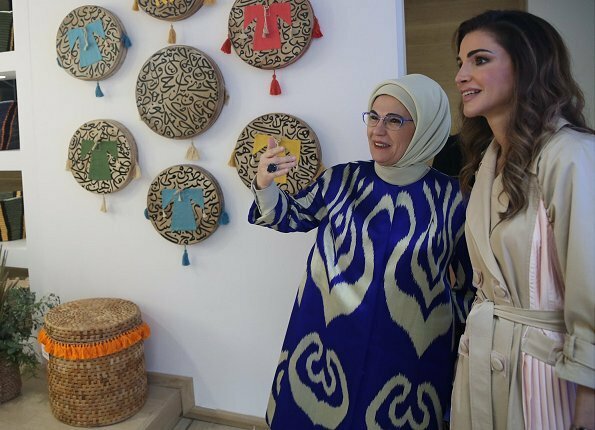 After the Turkish First Lady attended the conference, The Queen accompanied her to the Jordan River Foundation showroom in Abdoun Neighborhood, where she showed her the latest collection of traditional and contemporary handicrafts produced by Jordanian female artisans. Queen Rania also hosted Mrs. Erdogan for lunch at Daimeh restaurant at the JRF showroom. 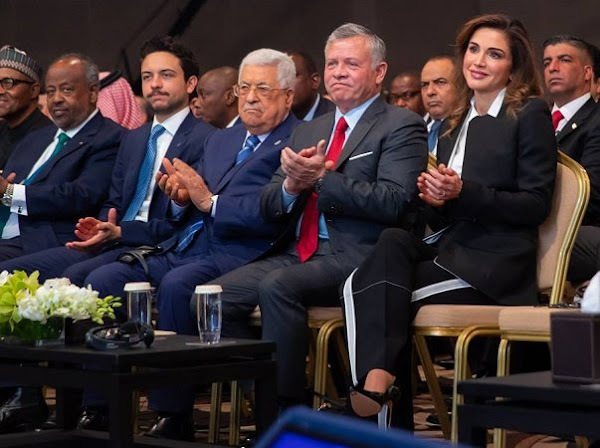 On April 06, 2019, King Abdullah II of Jordan, Queen Rania of Jordan and Crown Prince Hussein of Jordan attended the opening session of the World Economic Forum on the Middle East and North Africa. Both ladies look good. The second outfit of Rania is a bit different, not bad,don't care much for the white strip on the side of the pants. oh well I am not wearing the she is. A recent expose in the media evaluated a number if royal ladies wardrobes for their cost. Rania officially objected to being on this list because she claims her entire wardrobe is donated. This is good news for the Jordanian people because they are an economically poor nation. But the problen for Rania is she becomes a fashion victim. Although her slim figure means she can wear most styles, her designer donors obviously give her clothing styles with details that are far too distracting, loke the strange pink details on the coat and the equally strange deconstructed black jacket. This is not a great thing, and is unnecessary as Rania is already the centre of attention. I like that she is fashion forward and not always plays it safe, as so many others. The details are for me very interesting, as they are - for me - an high expression of creativity. Love the pantsuit with the interesting jacket, and the very trendy white stripe, I also think that she looks fantastic in pants. 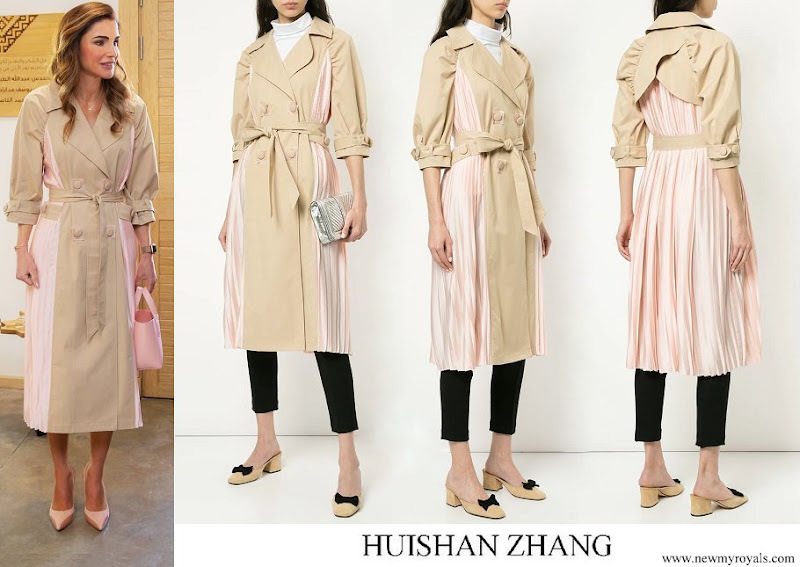 I do not like the trench style dress with the pink fabric, it is definitely a risky bet, but I don't think the final result is great, lovely shoes and bag. She can pull it off, she is a beautiful women. Rania is so beautiful and has proven that she can look smashing. Most of the time however, she unnecessarily follows short-lived trends, chooses items with too much going on, mismatches pieces and ends up looking like a fashion victim (including the two outfits featured above). In my opinion she looks best and most herself and most authentic in clothing inspired by the rich culture of her own region.